The Rhode Island Lottery was inaugurated in 1974 and is a charter member of the Multi-State Lottery Association. The revenue the lottery generates goes to Rhode Island’s State General Fund. This benefits all RI residents with support towards tax relief, education, public safety, law enforcement, and human services. Rhode Island Lottery tickets can be purchased from any authorized retailer within the state of Rhode Island. Winning tickets are valid for 1 year after the draw date, which means that players must claim their prizes within that time frame. Can I buy RI Lottery tickets online? No. The Rhode Island Lottery does not sell tickets over the internet. Visit your nearest retailer to participate in any of their games. In Lucky For Life, players can win a top prize of $1,000 per day for life, and a second prize of $25,000 a year for life. These prizes are guaranteed to be paid to winners for a minimum of 20 years. To play, pick 5 numbers from 1 to 48, plus a Lucky Ball number from 1 to 18. Lucky For Life drawings are held every Monday and Thursday at 10:38 PM EST. Wild Money is Rhode Island Lottery’s progressive jackpot game. That means that the jackpot – which starts at $20,000 – gets progressively larger until it’s won. To play, pick 5 numbers from 1 to 35. Matching all 5 will award players with the jackpot. Wild Money drawings are held every Tuesday, Thursday, and Saturday at 7:29 PM EST. To play The Numbers game, first you must choose your game type (4 digits, 3 digits, back 3 digits, or front 2 digits). Next, select your bet type (straight, box, or combo). Third, set your wager. Finally, pick your numbers depending on your game type. Successfully match your chosen numbers with the official draw to win up to $25,000. The Instant Match feature allows players to win up to $500 instantly. The Numbers drawings are two times daily. The first drawing is at 1:30 PM EST on all days, and the second one is at 6:59 PM (except on Sundays when it is at 6:29 PM). Rhode Island Lottery’s Keno game can be played 3 different ways: regular Keno with a top prize of $100,000; Keno Overtime with a top prize of $500,000; and Keno Plus with a massive $1 million jackpot. All 3 versions will require players to choose up to 10 spots (numbers) to play. Winning will depend on your wager and how many spots you play. Keno drawings are held everyday, every 4 minutes, starting at 5:00 AM EST (7:00 AM on Sundays) and ending at 12:44 AM on all days. Win up to $100,000 with Rhode Island Lottery’s Bingo game. To play, just pick your wager amount, set how many boards you want to play per game, and how many consecutive games you’d like to join. Your Bingo boards will be randomly generated by the terminal and then 30 numbers are “called” or “drawn.” Match these numbers with the numbers on your board to form patterns and win cash prizes. Bingo drawings are held everyday, every 8 minutes, starting at 5:00 AM EST (7:00 AM on Sundays) and ending at 12:42 AM on all days. Patrick Darigan of Chepachet, won $10,914 playing The Numbers. He claimed his prize last November 21, 2018. Erica Dadona of Cranston, won $50,000 playing the instant game Frogger. She claimed his prize last January 18, 2018. Gary Johnson of Warwick, won $20,500 playing Keno. He claimed his prize last December 29, 2017. Jose Marti Garcia of Pawtucket, won $100,000 playing the instant game Pinball Wizard. He claimed his prize last March 3, 2017. 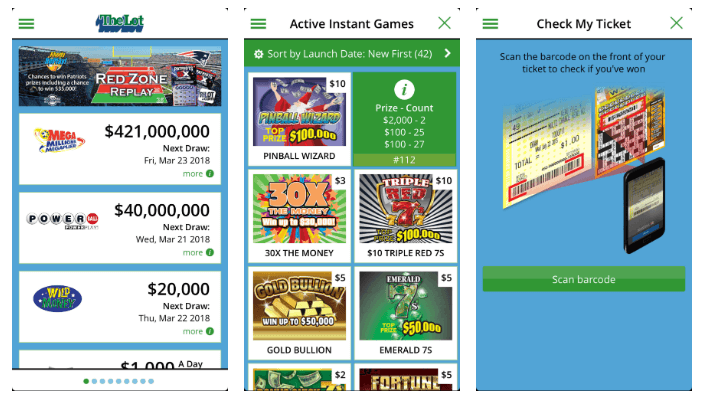 With dozens of instant scratch games active at any one time, the Rhode Island Lottery has plenty of choices available for those looking to win instant prizes. Tickets range from $1 to $25. Rhode Island Lottery Second Chances – What is Second Chance? Second chance drawings offer players a chance to enter their non-winning tickets for a second chance at winning prizes. These are promotional drawings that are only available for a limited time. How does Second Chance work for the RI Lottery? To enter second chance drawings for the Rhode Island Lottery, a player must have an active account with the Rhode Island Lottery VIP Club. Just sign up via the official website to start participating in second chance drawings. Stay updated with all Rhode Island Lottery news thanks to the official iOS and Android mobile apps. Visit the Apple App Store, Google Play Store, or Rhode Island Lottery’s official website to download the installer. Want to find out what the current Rhode Island Lottery winning numbers are? You can visit Lottery USA for more up-to-date information on the latest Rhode Island Lottery results. There you’ll find news on all Rhode Island Lottery draw games – including winning draws, jackpot size, next drawing dates, and more.